Tink's #69 Doe-In-Rut® Buck Lure is 100% natural doe estrous urine collected from live whitetail does during their estrous cycle. 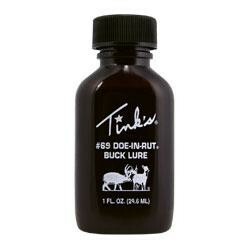 Tink's quality controlled formula keeps Tink's #69 Doe-In-Rut® Buck Lure at the peak level of performance. Tink's #69 Doe-In-Rut® Buck Lure, the standard on which all deer lures are measured, produces great results during the pre-rut and rut. Tink's #69 Doe-In-Rut® Buck Lure America's #1 Buck Lure!